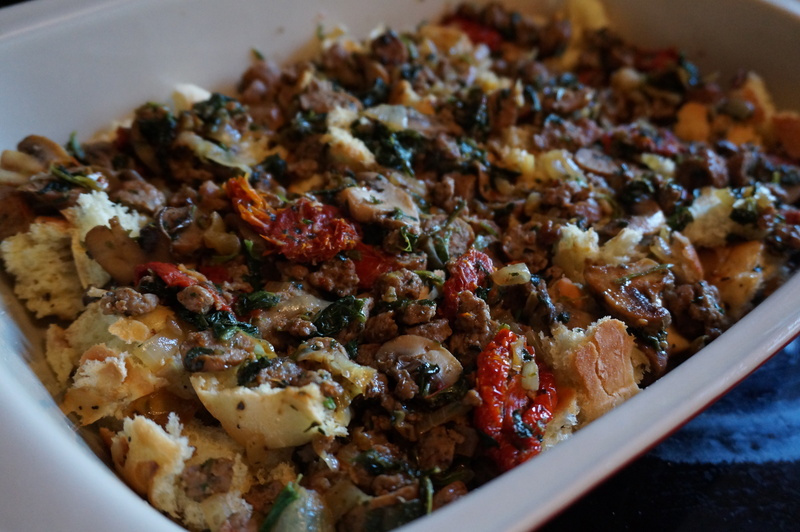 In other news, turkey sausage egg casserole was in the books for tonight! I had planned to make a Shepherd’s Pie for Ben to grab for dinners this week, but he said he’d prefer to have a lighter fare. I suggested quiche. He suggested egg casserole! Of course, I made it as gourmet as I could. Sun-dried tomatoes and all! I kept things easy with some pre-cooked turkey sausage and frozen spinach, day-old bakery buns, and un-skinned (but very washed!) sweet potatoes. 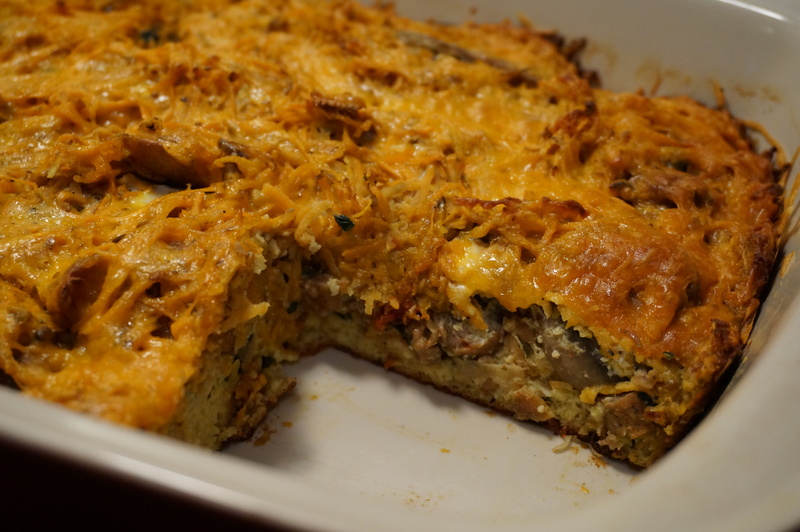 An easy and leftover-heavy egg casserole that can be enjoyed for breakfast, lunch, or dinner! Serve with a spinach side salad and dollop of Greek yogurt on top. 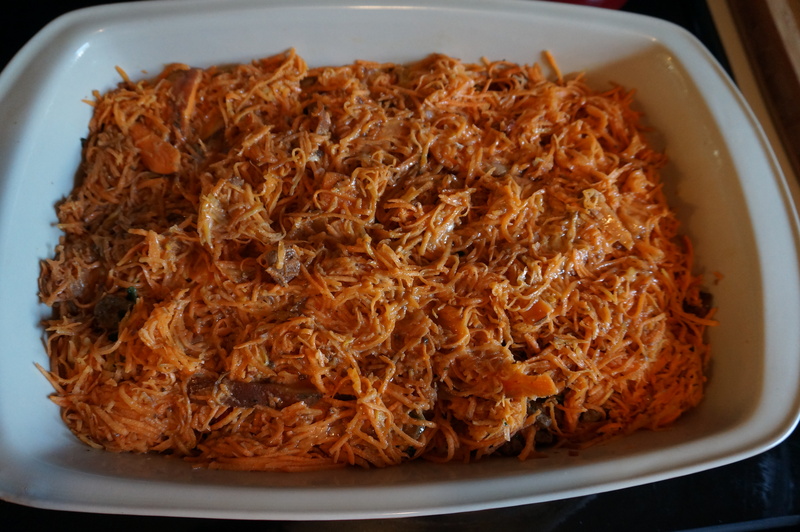 In a large casserole dish sprayed with cooking spray, tear buns into pieces and layer in bottom of dish. Heat 2 T olive oil in a large pan over medium-high heat. Add chopped onions, mushrooms, garlic, thyme, parsley, S+P, and cook for 3 minutes or until tender. 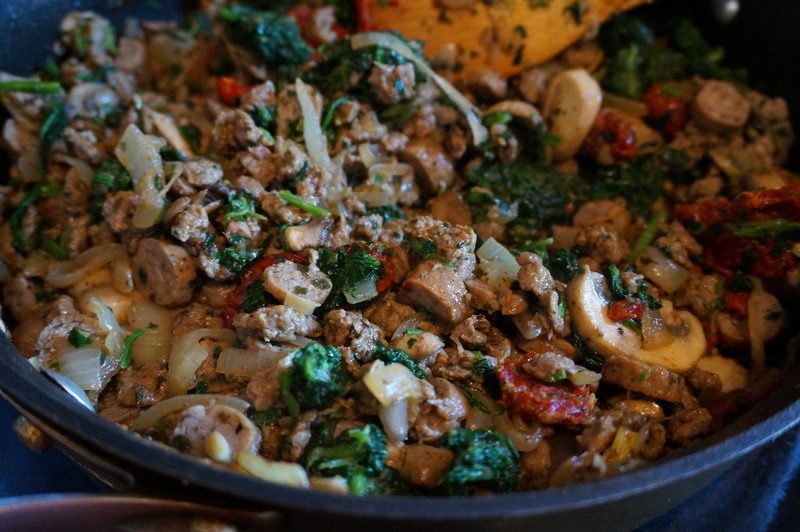 Stir in frozen spinach, tomatoes, and turkey sausage and cook for 2-3 more minutes until spinach is heated through. 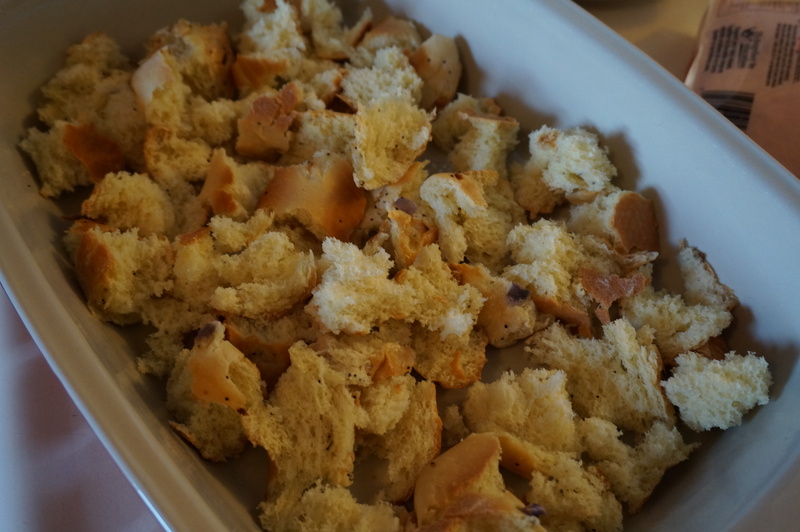 Pour over the bread in casserole dish. 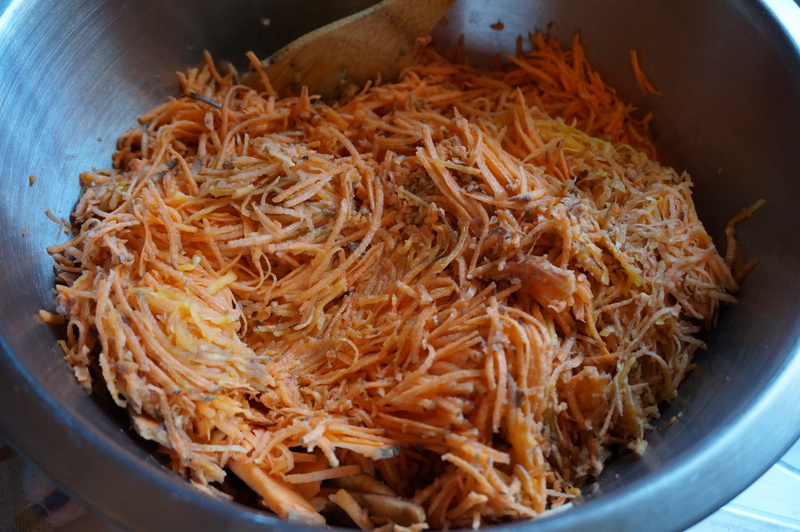 In a food processor set to shredding setting, shred sweet potatoes to medium-fine thickness. Pour into a large bowl and stir in remaining 2 T olive oil. Spread in an even layer over the top of the sausage. 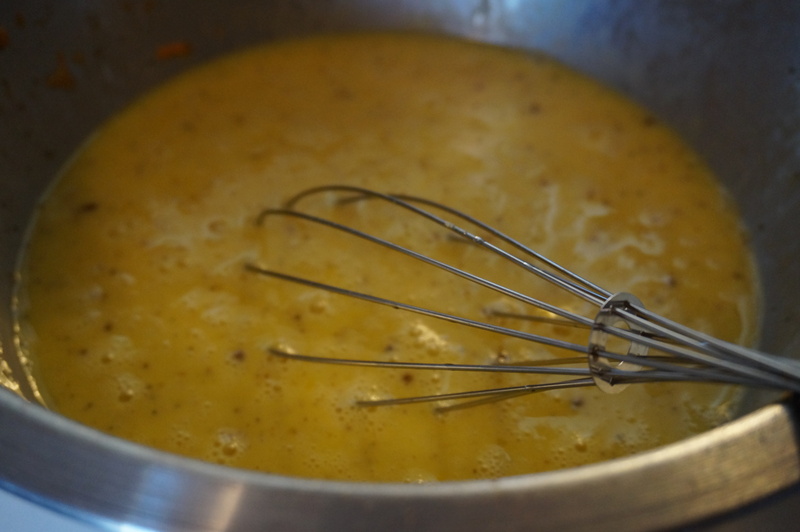 In same bowl, whisk together eggs, milk, nutmeg and garlic powder. Pour egg mixture evenly over potatoes in dish, shaking dish a bit to make sure it’s evenly distributed (I also sometimes press down the casserole to make sure the bread gets saturated). 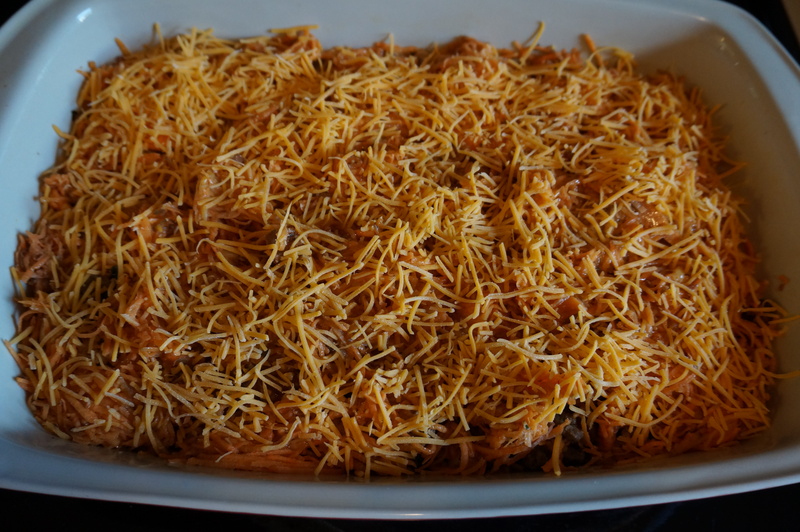 Top with cheese, cover with foil and refrigerate at least 30 minutes (up to overnight) to allow it to set. When ready to eat, heat oven to 350 deg and bake 40 mins covered, then 15 minutes uncovered or until potatoes are crisped and cheese is melted. Allow to set at least 10 min before slicing and serving! Serve with side salad and a dollop of greek yogurt or sour cream. 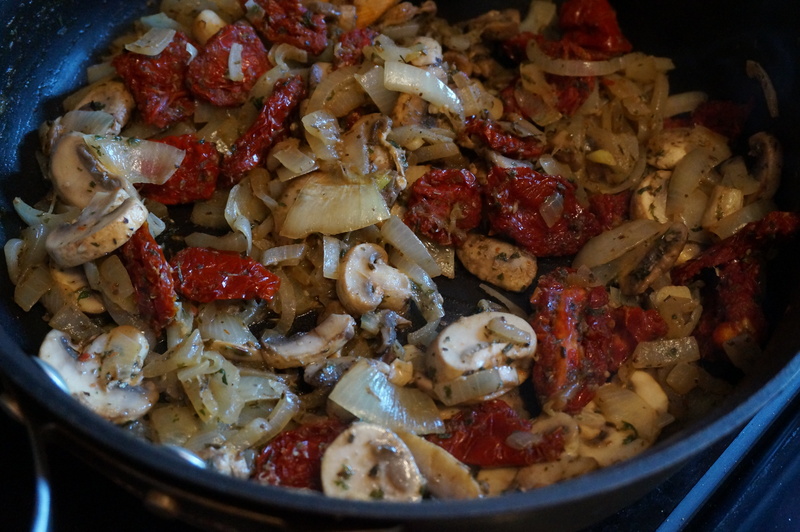 Cook onions, ‘shrooms, and tomatoes with garlic and spices. Tear bread and place in dish. Layer sausage mixture on top of bread. Bake at 350 until cheese is melted and taters are tender! 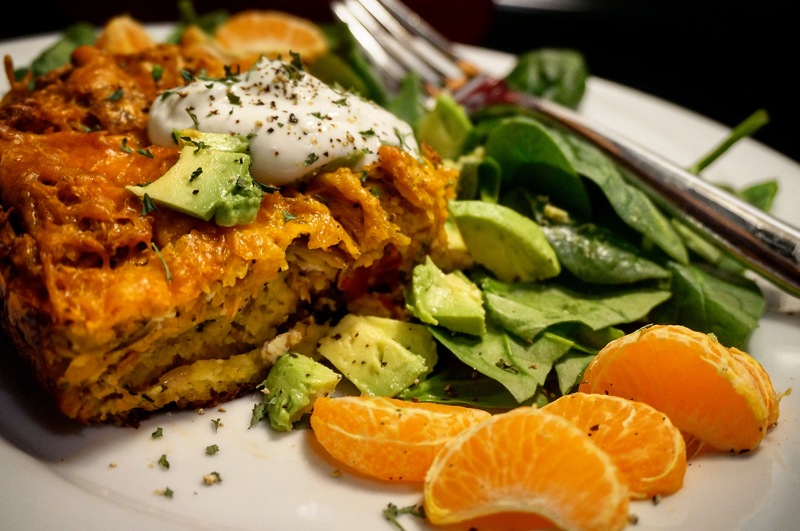 Serve with side salad, avocado wedges and greek yogurt.